This is not your typical squash dish, but it is unbelievably delicious. The two best things about this recipe (1) your guests will love this so much they will ask for the recipe (2) all the maple syrup that goes into it. Inevitably when pouring maple syrup, unless say you are a master syrup pourer, a few drops end up on your fingers. This is a wonderful opportunity to taste the golden goodness all on its own. As good as maple syrup is on just about everything, it is so incredibly perfect on its own. A relatively quick dish to make with simple to follow instructions, this is as good for holiday buffet tables as the dining table. It can easily be reheated without losing any of the original flavor (though making it immediately before serving is highly recommended over making it the day before unless absolutely necessary). Melt butter in heavy large deep skillet over high heat. Add squash; saute 1 minute. Add broth, syrup, thyme, salt, and pepper; bring to a boil. 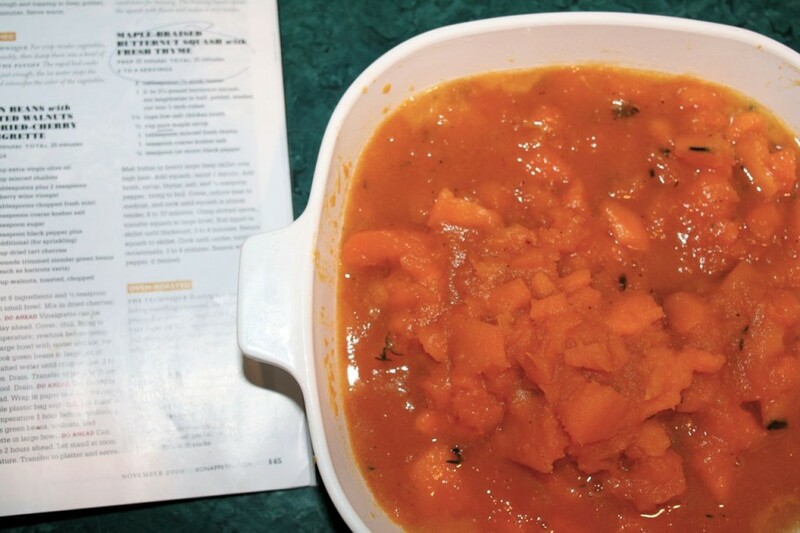 Cover, reduce heat to medium, and cook until squash is almost tender, 8 to 10 minutes. Using slotted spoon, transfer squash to large bowl. Boil liquid in skillet until thickened, 3 to 4 minutes. Return squash to skillet. Cook until tender, turning occasionally, 3 to 4 minutes. Season with more pepper, if desired. Photo courtesy of Delicious Musings.